By simply changing a few colors, you can do any of these projects to transition into each new season. These are all spring colors....to get you in the mood! Nondescript wood dressers can often be found for rock-bottom prices at garage sales. 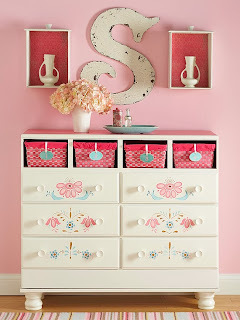 To give them a dose of character and contemporary style, cover the top in color and embellish the fronts with stencils. Removing drawers in favor of lined and labeled baskets is another easy way to add color and charm. Even if the art inside a frame isn't your style, a pretty frame is still a secondhand score. 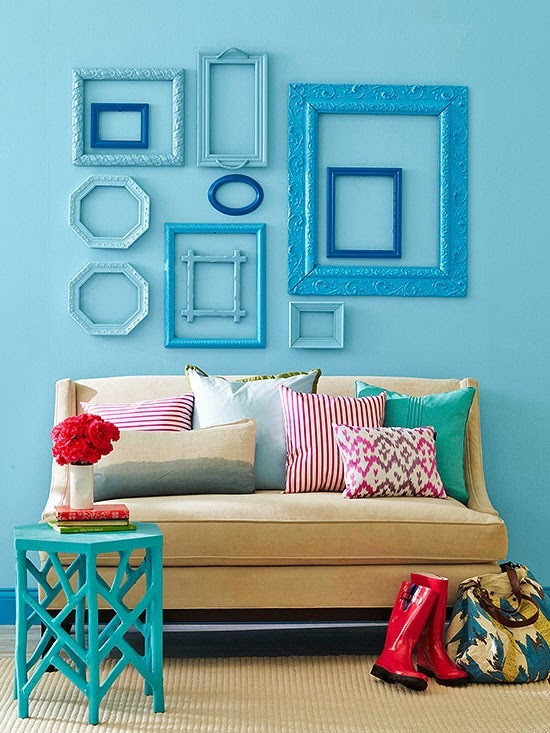 Round up a series of pretty frames, remove the art, spray paint them in a unifying color scheme, and arrange them on a wall. While one paint color is good, two are even better. Add in some glitter and you have a knock-out DIY project. 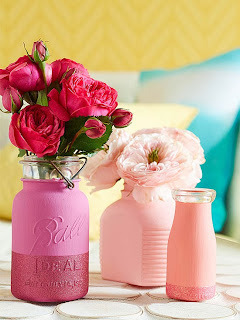 Paint the outside of jars and glass containers with two coats of clay paint. We mixed several shades of pink with white to create a range of hues. For a touch of glam, mask off the top of the jar with painter's tape and cover the bottom with glitter spray paint. Decoupage a lovely design on a thrift store table. Paint the table with two coats of metallic paint. Cover with metallic glaze for extra shine. Let dry. Cut a scrap of wallpaper to cover the tabletop. 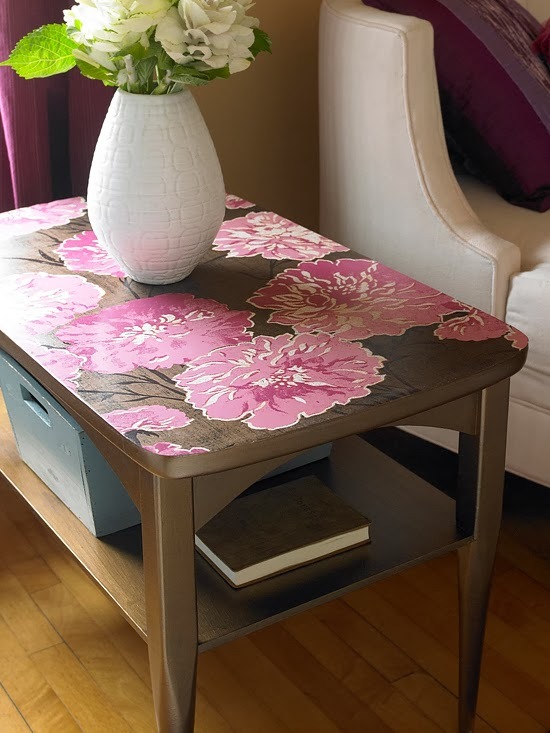 Coat the top with decoupage glue. Position the paper, pressing carefully to remove any air bubbles. Cover with multiple layers of glue. Let each coat dry before applying the next. Finish with a spray sealant. 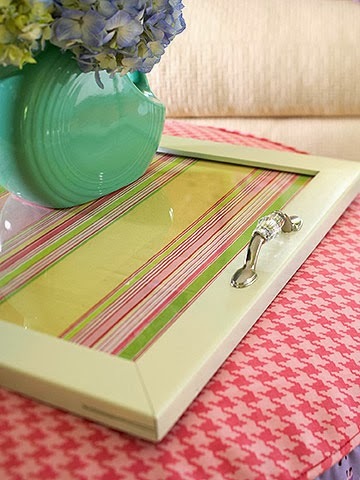 Reuse an old picture frame as a practical serving tray. Remove the glass of a large frame. 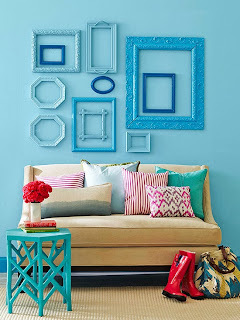 Paint the frame in your desired color. Attach drawer pulls to the short sides of the frame. Insert the glass with a piece of pretty fabric or decorative paper behind it. 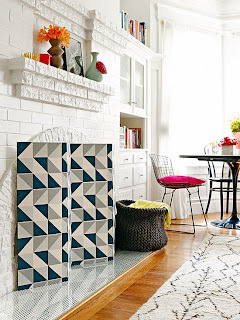 Create an easy screen to mask your fireplace -- or any space -- when it's not in use. 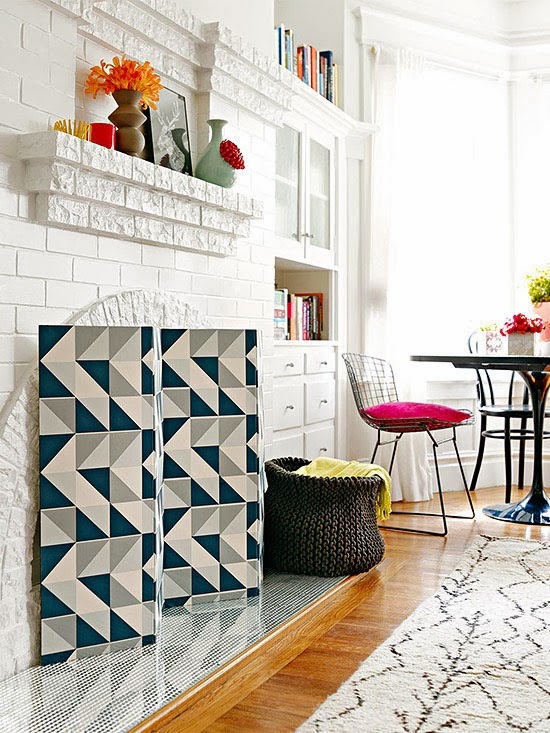 This bold geometric print pops in front of the white fireplace and mantel. Here's how to make it: Cut four pieces of 1/2-inch-thick particleboard to your desired size. (The screen's size depends on what you want it to cover. This fireplace is 32 inches wide; the screen is made from four 12x36-inch boards, which came precut from a home improvement store). Use interior latex paint to coat the boards in a color that complements your wallpaper (here, black). Cut strips of wallpaper 2 inches wider and longer than the particleboard. Apply a light layer of spray adhesive to one side of the board and to the back of the wallpaper. Press the adhesive side of the paper onto the adhesive side of the board. Start at the top middle and work your way down, smoothing air bubbles as you go. Wrap the excess around to the back and secure. Repeat for the other boards. Let the boards dry. Use superglue to affix small hinges to connect the boards on the painted side. Move the screen before you start a fire; this screen is for decorative purposes only.